This week was the Doughman Race which began and ended in the Durham Centre parking lot next to Hunt Street at the DFM. We participated in the adjoining food fair replete with Triangle food trucks and had an amazing time chatting up Doughman runners/bikers/swimmers/eaters and sold a ton of hand pies (Tex-Mex! ), challahs, salad (Spinach and Strawberry with Shaved Fennel, Toasted Almonds, and Lemon-Avocado dressing), and buttermilk biscuits. Shouts to this week's giveaway winner Kate M-M! Shouts to the crew: Thanks as always to our wonderful crew, Chef Matt, Lauren, Andy, Sara&Jeff, Jaime&Nancy. This week we were lucky enough to have our bike delivery boy Jaime help out in the kitchen. I was impressed with how fast he picked up the challah braiding. This week: Day One is back in effect this Saturday starting at 5PM. Family Night (tenders and tacos)! South Korean ladies don't get fat. 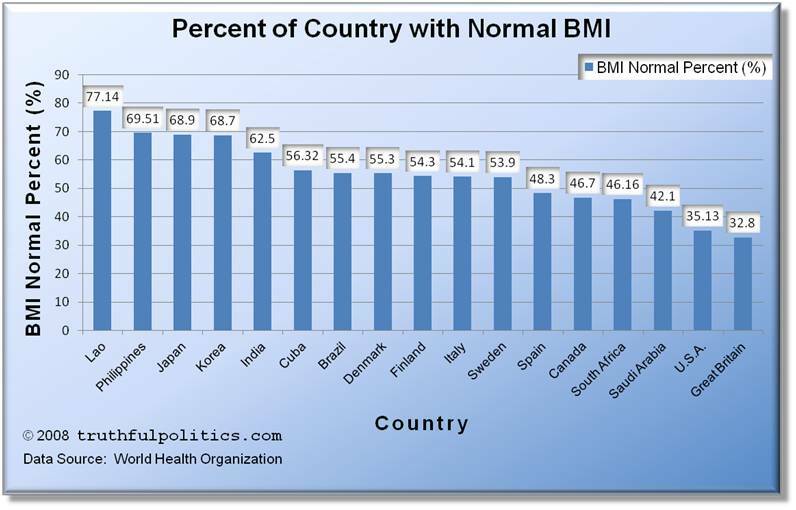 If you look at the chart below, you will notice that South Korea has an obesity rate of 2.1% (2011). The US, by contrast, has an obesity rate of 28.5%. 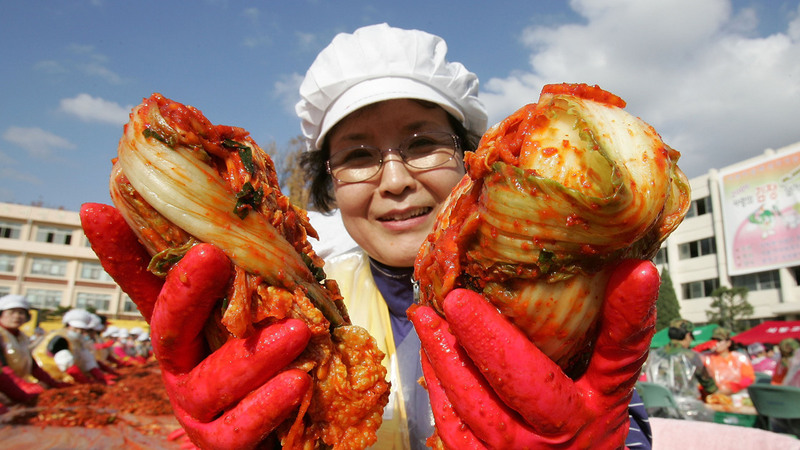 The key to South Korean fitness revolves around the consumption of fermented foods. Why would fermented foods keep you skinny? Fermented foods help us fire neurochemicals signalling satiation in the brain. The only way to become skinny is to consistently limit the number of calories you consume. The faster your brain becomes satisfied, the less you will need to eat. Why does fermented food signal satiation? Fermented foods contain both natural acids (lactic and acetic acids) as well as digestive enzymes. Both of these things help to slow down the body's digestion. The slower the digestion, the faster the brain signals satiation. Think of it like this: If you were to eat four Oreos, a highly refined product loaded with simple sugars, the brain might say, "Great, I can turn all of that blood sugar really quickly and easily. Give me some more!" This is why it is so easy to overeat on highly refined foods and then feel sick later. But if you were to eat the Oreos coupled with a fermented food, your brain might say, "Wow! That was really intense. This is going to take me awhile to digest so I'm actually feeling pretty full and will stop right there." One of the things that never ceases to amaze me is how much there is to learn about our customers' preferences and tastes. I would say that a company that feels they know everything about their clientele is not pushing the envelope. With the Day One project, we initially tried to build off the enthusiasm from the Ramen Night by offering a sit-down experience with a prix fixe menu. As it turns out, even for an ardent niche market like the vegan community, attempting to change the menu every other week and expecting our fans to follow every new theme was likely unreasonable. Ramen Night was successful in part because we promoted it with six weeks of lead time. Day One has been up and running for nearly two months now and we have learned that with the short promotion lead times, it is likely more prudent to go with a more informal set-up and more family-friendly foods. This lowers our price point as well, which is a sensitive issue for those who typically think about sliding-scale affordability. We look forward to serving you next on Saturday, June 1 with FAMILY NIGHT, 5PM-10PM at Ninth Street Bakery. Please feel free to leave comments or questions with any other suggestions you might have for us. This week things got crazy with our concept. Portabello Vegan Jerky? Hand-cut BBQ Potato Chips? Fakey Oreos? Who does this? Next week is our last week for corner store/bodega gastronomy. Come join us before we pour the last glass of Grape Drink. Proceeds go to benefit the Durham Interfaith Hospitality Network and raise awareness about food deserts in Durham (where some of the foods we have to offer are the only food choices available on a daily basis for our fellow Durhamites; and if you don't believe me, just ask Dennis Coles). This week we came to market with Jamaican Jerk Tofu Savory Vegan Hand Pies, Apple Caramel Sweet Vegan Hand Pies, Bagels, Buttermilk Cake Donuts, and Potato Salad (Vegan). Mad shouts to the crew: Chef Matt, Val, Andy, Sara&Jeff, Nancy&Jaime, Lauren M.
Write-up this week from SZ who ran the market as I was out of town. Also big ups to our crew Jason, Josh, Val, Chef Matt, and Andy! It was a brisk and cloudy Saturday morning, but that didn't stop the crowds from descending on the market. The stand was left with only a handful of Caramelized Banana hand pies when noon rolled around. The Caramelized Onion and Sweet Potato Savory Hand pies were a huge hit, followed closely by Matt's Superfood Salad [Ingredients: kale, edamame, black beans, carrot, onion, cranberries, toasted sunflower seeds, dressing (rice wine vinegar, sugar, Dijon mustard, grape seed oil, garlic, salt, pepper)]. Big thanks to Josh and Jason for lending their time -- they were a huge help! 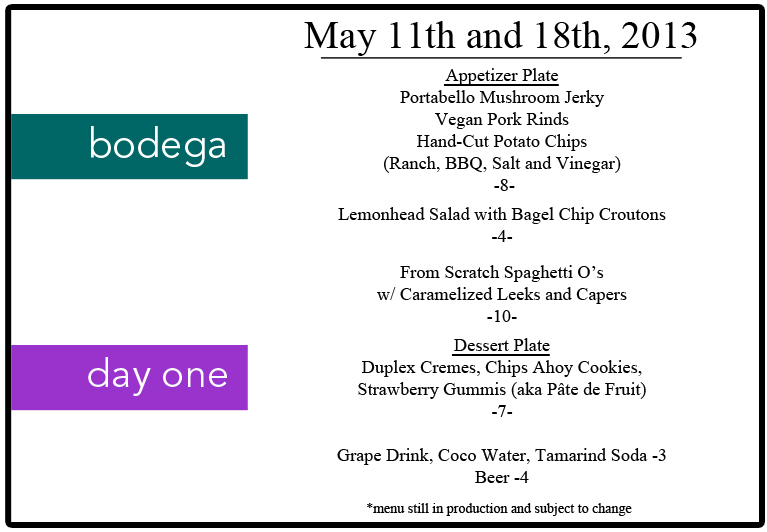 On May 11th and May 18th, Day One Vegan Pop-up will be composing a menu from scratch, inspired by gas stations, bodegas, corner stores, and convenience stores. Please see the menu posted below. On March 22nd, I attended the Duke/Durham Health Summit, an annual event that sits at the crossroads of Durham community health and the Duke Health System. The theme of food deserts came up several times, as well as the statistic that the poverty rate in Durham has jumped from 13.6% (2008) to 20.4% (2011) (American Community Survey). That means one in five Durhamites live in poverty, and that number increases to one in four (27%) when you look at the child population. Connecting poverty to food deserts is not a reach. We often talk of low-income communities, when really we should be talking about no-income communities. When families do not have a disposable $15-20 to buy ingredients for several meals at a time, they visit corner stores to purchase single meals that are sustaining and will cost only $2-3 each. These meals are generally cookies, candy, chips, and soda. To confirm this, Matt Props and I traveled to Trinity Food Mart, M&M Food Mart, Holloway Street Food Mart, and Big Apples. We started at Trinity, and as we moved East, the choices that you might find at an ordinary gas station became slimmer and slimmer, the aisles more bare, and the point of sale enclosed by a plastic barrier. To raise awareness on the dearth of choices available at corner stores, as well as the poverty that forces those choices, Chef Matt and I are next going to do a menu of corner store gastronomy, except everything will be made entirely from scratch, and vegan to boot. We will donate $0.75 of every entree purchased to the Durham Interfaith Hospitality Network which serves homeless families with children, with an additional lump sum to them at the end, and additionally we will provide a personally prepared pop-up dinner for this charitable organization's clients. We hope that you can join us on either May 11th or May 18th at Ninth Street Bakery (136 E Chapel Hill St., Durham) to sample our take on some corner store classics and raise awareness about food deserts in Durham.